It's all Ted's fault. During the past week Ted Guggenheim, iggli's VP Finance and Business Development, had been after me to take some time off this Labor Day weekend and head up to Jazz Aspen Snowmass. When I was slow about booking a room and purchasing tickets, he grabbed my credit card and did it for me. So here we are, Nanette and me, in beautiful Snowmass, CO, attending a great music festival and having a terrific time. Yesterday we saw Galactic, Joss Stone and John Legend. The Galactic show was great but the 2:30 pm start time was clearly too early for most of the festival attendees. The crowd didn't really reach a significant size until later in the day, when Joss Stone took the stage. Propelled by the polyrhythmic wizardry of Stanton Moore on drums, Galactic featured wave after wave of New Orleans influenced "fonk." The band, which has delivered some wonderful instrumental work and sizzling grooves over the years, has never been known for its vocal element. Nevertheless, the most recent Galactic recording, From the Corner to the Block, features contributions by a host of guest MCs, including Lyrics Born, the Coup's Boots Riley, Chali 2na from Jurassic 5, Mr. Lif and Gift of Gab from Blackalicious, and more. The live show's tastiest bits were highlights from keyboardist Rich Vogel and sax player Ben Ellman punctuating a Stanton Moore groove-driven, MC-supported set. What can you say about Joss Stone? For starters, how is it possible that the petite body of a 19 year old girl from the UK can produce a voice that sounds for all the world like it belongs to a black soul singing diva raised in Detroit, Michigan. In 1969. Damn this girl can sing! OK, so the most recent recording, Introducing Joss Stone, needed a little guidance. Her previous releases, The Soul Sessions, and Mind, Body & Soul, were extraordinary. "Introducing," well . . . not so much. But her voice! Wow! On stage, barefoot, pale and fragile looking, she stalked from one edge of the platform to the other and she just WAILED!! For those of you who remember Joss as a blond . . .
. . . well, you'll have to readjust your image just a bit. At this show, Joss was a brunette, with purple highlights - more like the second photo. And purple seemed to be the color of the day - gracing the clothing of nearly all the supporting musicians and backup singers. Incidentally, I counted 11 members in Joss's onstage entourage. Two keyboard players, bass, drums, guitar, two horns, and three backup singers. And, of course, Joss. At the end of nearly every tune, Joss let loose a diminutive little "Thank you!" to the crowd, in a voice so small you'd have thought she had become an entirely different person. When she speaks, she's a 19 year old girl; when she sings, she's a 35 year old black Diva from the Motor City. 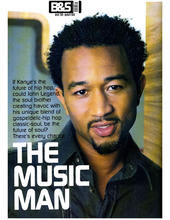 Then there's John Legend. This guy's a star. The whole package. Exceptional vocals. Great piano player - with all the gospel and R&B roots you could want. Oh, and the good looks that seem guaranteed to drive female fans wild. One of those female fans, Carolyn Powers (who, with her husband Bill was the named sponsor of the John Legend portion of the festival) joined John on stage for a little slow dancing. She seemed quite delighted. The show featured all the hits: Used to Love U, Save Room (for My Love), Heaven, P.D.A. (We Just Don't Care) and Ordinary People. And John was in great form. Too bad the sound techs couldn't locate the source of a short that periodically interrupted the performance with annoying and distracting static. 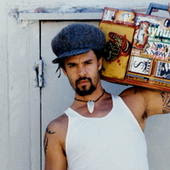 Today - Sunday - we're most looking forward to Michael Franti & Spearhead. I got to know Michael a little bit during his making of Everyone Deserves Music. For awhile I had hopes of becoming involved directly with his career. That didn't happen. But during the course of the discussions - which took place in San Francisco and Beverley Hills - I learned a lot about Michael, his sense of mission and his operation. His manager, Catherine Enny, also became a friend. She's a sweetheart! Oh yeah right Tom. We all feel so bad for you!